Do you want to use Instagram to get more relevant traffic, even leads, for your business? Today, I’m giving you actionable Instagram lead generation ideas. Lets talk about generating leads from Instagram. You can watch the video above or read this post. The tips outlined here are from a post by Joshua Boyd of Brandwatch, part of its Complete Guide to Social Media Lead Generation. Below I share my fav quote from it and three key points. ** Instagram strategy may depend on your business. Since Instagram is visual, if you have a product, a personal brand or a store, you can generate website traffic and leads. With B2B it is often best used for brand awareness. ** Use targeted Hashtags to expand your reach. When was the last time you looked for more relevant hashtags? Use Instagram search or observe tags used by those in your industry that you haven’t tried. 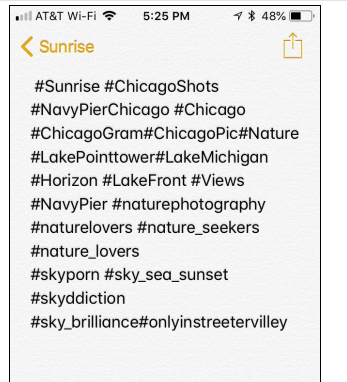 Tailor hashtags to each post rather than using the same list all the time. Save frequently-used sets of hashtags in a Notes app on your phone so you can copy and paste them into relevant posts. ** Be sure your Profile has your website link and contact button so those interested can click over to your site. See the email link in this Instagram profile screenshot below. See also this post on How to Add Instagram Action Buttons to a Business Profile.